FARSLEY CELTIC Juniors destroyed Ealandians in a remarkable 9-0 away victory, tightening their grip on top spot and the bid for the Yorkshire Amateur League Premier Division title. Eighth-placed Ealandians were helpless and the writing was on the wall after 10 minutes with Farsley three goals in front. Leading 4-0 at the break, Farsley romped to victory with Louis Surtees scoring four, supported by Joe Firth with a brace and Danny Lyon, Craig Farrand and Alex Gyte, who all grabbed one apiece. Farsley are now four points ahead of nearest rivals Grangefield Old Boys and are still unbeaten after 14 matches. 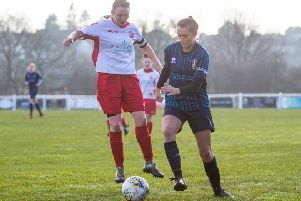 Grangefield scraped past second-bottom Stanley United in a 3-2 encounter meaning more frustration for Stanley who have endured a torrid time, losing three cup quarter-finals. Close to half-time Tom Hall gave Grangefield the lead from a free-kick before Shane Gaunt added a second goal shortly after the break. Stanley reduced the arrears after a thunderbolt from the edge of the box but Andy Kenyon added a goal to give Grangefield a 3-1 advantage before a late Stanley goal led to a nail-biting end. Rhys Bruce and Ben Laycock both netted for Stanley. Drighlington demolished Wibsey 7-0 away from home with Wibsey having a torrid time and, despite some promising displays, sit bottom of the Premier Division with defensive frailties not helping their season’s cause. Shane Sowden bagged five goals as well as Harvey Booth hitting two from distance. Three goals in the first 20 minutes of the second half killed the game as a contest and, after that, it was one way traffic. Elsewhere, a crucial 5-3 success for Athletico against Stanningley Old Boys saw them rise to eighth. Stanningley made a shocking start as they gifted Athletico two goals in the first 20 minutes. Stanningley, though, hit back through a good finish by centre-half Dale McCormack in the 28th minute. Athletico then restored their two-goal advantage shortly before the break but Stanningley were not done with the visitors given the opportunity to pull a goal back from the penalty spot. Tom Stewart converted for Stanningley, who then drew level thanks to a Dave Lowther run and finish. But Athletico showed their resilience and added their winning goals in the 75th and 80th minutes. Goals for Athletico came from Mohammed Qasim with a couple, Adeeb Jawad also with two and Mohammed Raaj with one. In the final Premier Division game, Horsforth St Margaret’s won a fantastic battle with visitors Alwoodley, 3-2. A free-kick from James Watson gave Horsforth the lead but Steve Dyer soon equalised on the stroke of half-time in a scrappy 45 minutes. Damir Mulavdic gave Alwoodley a 2-1 advantage when he was found three yards out following a deflection. Man of the match Jake Williams then found the bottom corner with a great finish to restore parity at 2-2. But the last kick of the match fell to Will Harris who won the game for Horsforth. The only game that survived in the Championship was involving league leaders Morley Town AFC who brushed aside visitors Leeds Medics & Dentists Reserves 4-1. The effect of this victory is that Morley now lead the Championship by three points. Nathanial Hazell put the hosts one up at half-time and Aiden Phillip, Ryan Hartley and Nathanial Hazell again secured all three points before Medics Res struck a late consolation goal. In Division One, Collegians took over top spot and moved two points clear with a 3-0 win at home to Leeds Medics & Dentists Reserves. 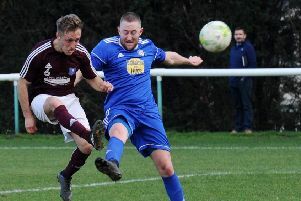 Scott Kirkbright, Joe Wimpenny and Ryan Fuller all netted with Collegians then discovering that former leaders Woodkirk Valley had lost 4-1 at Farsley Celtic Juniors Reserves. Amaranth Crossgates are one point behind Woodkirk and with three games in hand following a 3-1 success at Beeston Juniors Old Boys.